Filipa Ramos, ed. Animals. Whitechapel Documents of Contemporary Art. Cambridge: MIT Press, 2016. 240 pages. Edited by Filipa Ramos, Animals (2016) emerges out of the prolific Documents of Contemporary Art series co-published by Whitechapel Gallery and MIT Press since 2006, an endeavor which has yielded 45 volumes, each tackling a particular theme, practice or concern. This particular iteration takes as its point of departure the long-standing inclusion of animals in visual art through time and across cultures, but moves beyond the mere representation of animals in order to look carefully at the rising interest to consider them in the development of new methodologies, modes of artistic production, and perhaps most importantly, ways of being in the world. Cats and dogs; slugs and cephaloids; bats and other unidentified creatures – these represent a fraction of the non-human others we encounter throughout the contributions to the volume. Ramos is a Lisbon-born writer, educator and curator whose current role as Editor in Chief of art-agenda and previous involvement with Documenta 13 (2012) and 14 (2017) by way of the Manifesta Journal are reflected through her editorial choices, with an emphasis on international contemporary art exhibition circuits as a principal site for the exploration of interspecies relationships and their transformative potential. After all, as Ana Teixeira Pinto’s contribution reminds us, “human and animal are flexible concepts, able to connote the social as well as the biological” (107). In human practices of meaning-making, animals and animality act as a meeting point for concerns of philosophy, ethics, aesthetics, postcolonialism, feminism(s) and queer theory, life sciences and eco-criticism. The generative potential of these intersections is increasingly heightened by the popularization of conversations around the Anthropocene and human impact on the planet, for better or for worse. Critical theory, narrative, poetry, and art writing from authors an incredible range of disciplinary positions grace Animals‘ pages, with the volume itself organized into four sections or sub-thematics, “Fables,” “Gazes,” “Mutations,” and “Struggles”. Each section moves with its own particular rhythm, but in every case more experimental writing is anchored with excerpts from canonical texts in non-human discourses such as John Berger’s “Why Look at Animals”; Gilles Deleuze and Félix Guattari’s “Percept, Affect, Concept”; and Donna Haraway’s Companion Species Manifesto: Dogs, People and Significant Otherness. Among the less conventional texts, one standout inclusion is a poem titled “Some Animals,” specifically written by Joan Jonas for this survey. This commission works/gestures toward the possibility for this anthology to function not just as collected recent proceedings in animal discourses, but continue to contribute to and shape ongoing conversations. 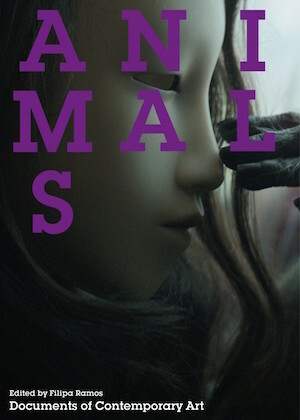 The concrete poem moves through fragments of rich and evocative animal imagery which hint not only at our sentimental narrations of non-human companions, but practices of taxidermy and preservation, of the human urge to represent animal others: a paper mache fox, a fish carved of stone, a ceramic bird, a bronze horse. Cluny was obsessed with bringing me gifts of feathers: blue jay, dove, blackbird, owl. This cat communicated devotion, a providence – a transcendent shift emblematic of his movement between animal and human realms – through feathers (37). This simple sentiment acknowledges the unique position domesticated animals hold and the immense influence they have in shaping the lives of those who choose to keep them as companions. The inclusion of Schneeman’s text which points to her own performance serves as a poignant reminder that as productive and perspective shifting writing can be in shaping interspecies dialogues, acts of performance and other mediums of contemporary art function through different forms of being in relation. It is an embodied practice that was sustained by Schneemann over her long career as a feminist artist through the positioning of cats as her muses, her collaborators, her lovers. The purpose of any anthology-style book is not to give the penultimate comprehensive survey of its dedicated thematic, but rather survey a variety of perspectives. With that being said, there does seem to be one blind spot in Ramos’ ambitious and thoughtful editorial project – namely, the ethical implications and debates around rising interest in posthuman discourse and the inclusion of real flesh and blood animals in the installation practices of a number of contemporary artists. Pierre Huyghe’s work, which graces the cover of the book, is mentioned in the opening lines of Ramos’ introduction, and in a few of the essays as one of the most recognized artists to advance conversations about the human and non-human. Huyghe is one of many artists in a lineage (including Joseph Beuys and his performances with animal Others) that have introduced wild or domesticated animals of all varieties into the creation of their work. Yet how does this shift our understanding of consensual and non-hierarchical co-creation or collaboration in the production of a work of art? What are the ethics of care in working with non-humans with whom we can have varying degrees of communication? With the rising interest in working with animals, what systems might be put in place to regulate artist’s “use” of non-human others in museum and gallery contexts? What are the implications of our shifting figurations of animals on actual animal welfare?